Each year, twenty thousand lost and abandoned animals are taken in by Greenville County Animal Care. Some of these animals never make it home because they can't be identified. Microchipping offers pet owners the only truly permanent method of identifying your pet and linking the animal back to you, the owner. Collar tags can break or become unreadable and tattooing can become illegible. So, if you want to improve your pet's chances of getting home fast and safe in case it were to go missing, microchipping is your best option. Greenville County Animal Care can microchip your dog or cat for only $10 and walk-ins are welcome every Tuesday from 5:00pm-6:30pm. Check out our Vaccination Clinic page for more information. Cats are naturally curious and unpredictable. In the event that your cat strays away from the safety of your home a microchip is your cat's best chance of a fast return. Animal microchips are about the size of a grain of rice and are typically implanted just beneath the surface of the skin between the shoulder blades. The process is similar to receiving vaccination through a needle and is painless to pets. Most animals don't even react when the microchip is implanted, though sometimes minor swelling or slight bleeding can occur at the injection site. Once implanted the microchip remains between the shoulder blades just beneath the skin for the rest of the animal's lifetime, becoming a permanent form of identification. If my pet is found by an individual how will they know to call 24PetWatch? All pets microchipped at Greenville County Animal Care are provided with a plastic collar tag that features your pet's unique microchip number as well as the 24PetWatchLost Pet Recovery Service toll-free number (1.866.597.2424). In the event that your pet is not wearing the tag, or if the tag is broken, scratched or weathered, the finder would contact a shelter, humane society, or veterinary clinic. They will be asked to bring the pet to them so it can be scanned for a microchip and the right owner contacted. What happens if my pet is taken to a shelter or humane society? All animals that are brought into Greenville County Animal Care are routinely scanned for a microchip, so long as they are safe to handle. In the event that a microchip is present, the staff will contact 24PetWatch and when we match your pet's microchip to your contact information we will call and inform you that your pet has been found and make arrangements for you to reclaim your pet at our facility. What should I do if my microchipped pet goes missing? First, call 24PetWatch at 1.866.597.2424, choose the lost pet option and let the microchip company know that your pet has gone missing. They will confirm all of your contact information is correct and contact you when your pet is recovered. Second, click here and complete an electronic lost report. This information is received daily by the Animal Care staff at Greenville County Animal Care. As soon as your pet is found, either by an individual or by animal control, we will call you immediately and connect you to your pet's rescuer or make arrangements for you to reclaim your pet at our facility. Third, visit Greenville County Animal Care receiving/intake center frequently and look for your lost pet. For directions to our facility, click here. Is that the letter O or a zero at the beginning of my microchip number? There are no letter O's in any Microchip ID it is ALWAYS a numerical zero. If my pet is lost how does the chip work? The microchip holds a unique identification number. This number is also stored in the 24PetWatch database, linking it to your contact information, pet details and your pet's vet information. Animal shelters, rescues, vets and humane societies nationwide scan each found pet as a standard procedure, and should a 24PetWatch microchip be detected, your information can be quickly found and you will be called. Pet ownership cannot be changed in the 24PetWatch system without your written consent, so you can rest assured that your pet can be returned to you. What if I'm not available when you call? If we cannot reach you we will leave a voicemail and contact your emergency contact as well. In that time, we will ask the finder of your pet to keep it safe. If they cannot do that, we will ask them to bring it to Greenville County Animal Care. Is the microchip a GPS device? Pet microchips are NOT GPS devices. 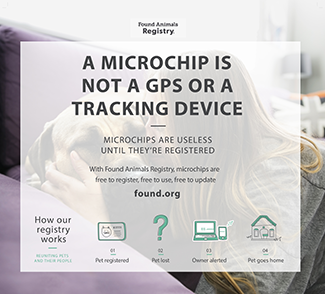 The location of a lost pet cannot be searched using a microchip. How long will a microchip last? Do they get replaced? The microchips used to identify pets will last a lifetime. Once they are implanted in a pet, they will help identify that pet during its lifetime and won't need to be replaced. What else can I do to make sure my pet will be returned if they go missing? Your pet should always wear the 24PetWatch identification collar tag you received when you had your pet implanted with a microchip. The collar tag is the first line of contact if your pet ever becomes lost. Your pet's microchip is like insurance, meaning they are easily identified if they lose their collar and/or tags. If your pet is lost, the combination of the collar tag and microchip will help get them home fast and safe. Are pets ever allergic to microchips? 24PetWatch microchips are biocompatible. This means that they are designed to be compatible with a pet's body tissue and not cause an allergic reaction when professionally implanted. Does the microchip ever move in the body? 24PetWatch microchips are safely contained in biocompatible glass to prevent any movement. When implanted by a staff person trained and certified to implant microchips, there is very little chance of the microchip moving. We microchip pets of all ages. However, because of the size of the microchip needle, it can be difficult to microchip very young puppies and kittens - especially those weighing less than five pounds.